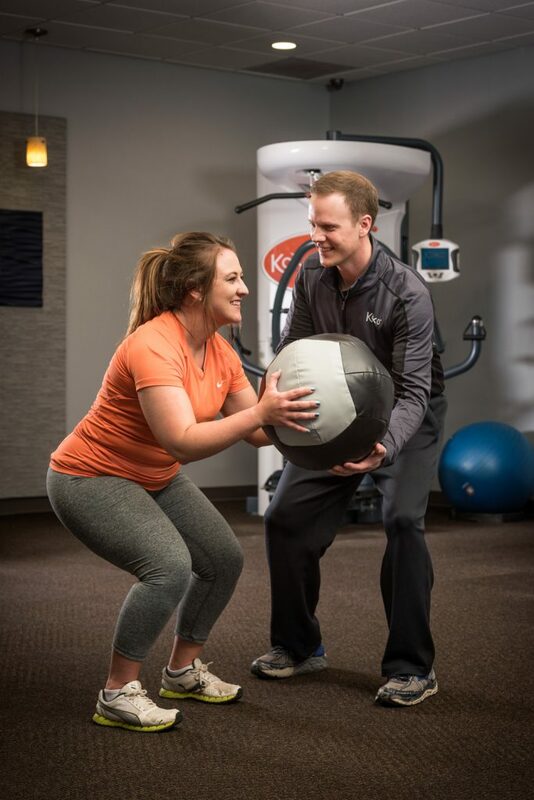 The Dynamax medicine balls are the newest addition to the Rapid City Koko Fitclub equipment. Dynamax balls are a soft, weighted, oversized medicine ball, which some may consider to be a traditional type of medicine ball. They come in multiple weights ranging from 4lbs to 30lbs – at Koko we offer the 12lbs, 16lbs, and 20lbs balls. Medicine balls are a great additive to the traditional workout. With medicine balls you are able to add different strength and power exercises into your workout routine. There are a multitude of exercises that can be done using this piece of equipment. Not only can you do ab exercises but pushups, throws, and even slams can be done with these medicine balls. One unique, versatile function of medicine balls is that they can be used for partner exercises, which also adds another whole dimension of fitness. Using medicine balls is a great way to train the core outside of traditional exercises. Developing a strong core is vital to staying healthy not only in day to day life, but it also helps reduce the risk of future injuries. If you are looking for a new and fresh routine, no matter what your fitness level, try some medicine ball exercises. Overhead throw to partner during sit-ups. Lay flat on the ground with legs at 90 degree angle. Have partner stand on toes, arms overhead with medicine ball in hands, sit up and throw ball to partner, while going back down have partner throw ball back to you with hands still overhead. Take two medicine balls one for feet and one for hands. Place both feet together and toes on one ball, extend body to a push up position and place hands on other ball forming a triangle and balance on both for plank and full body workout. Hold ball at chest, squat down and thrust full body up and ball against wall, catch the ball as it comes back and return to squat position.